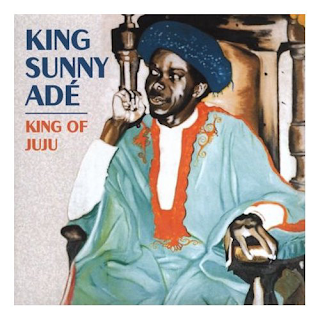 This is an intoxicating album compilation of the best of Nigeria's "King Of Juju", King Sunny Ade. apparently he has released over one hundred albums. This album provides an excellent introduction to the music known as "juju", based around West African "talking drums" and a lilting, melodic guitar sound that underpins pretty much every track, along with the drum rhythm of course. Where it differs from, say, the Afro-Beat of Fela Kuti is that it doesn't centre around the interjections of saxophone in the same way. Also the guitars are higher pitched, more tuneful than Kuti's regular, insistent strum. Ade's guitar sound is almost South Africa township in its tuneful sound. The iconic "Syncro System" kicks the album off with some seriously delicious percussion sounds, irresistible guitars and Ade's high pitched but honey-sweet voice. "365 Is My Number" showcases the afore-mentioned guitar sound perfectly. Just check out the drum/guitar part a few minutes in. Effortlessly brilliant. The sound quality is superb too, as well as the music. Ade also uses a Hawaiian-style guitar in places too, which is quite unique. "Ja Funmi" is more laid-back, intuitively seductive. That Hawaiian sound comes into this one. These tracks you can just put on and let them wind their rhythmic way all around your room, they get into a groove and they just seem to keep going, like Fela Kuti, but there is something more mellifluous in Ade's music than Kuti's. It is less militant, I feel. Although I don't understand the lyrics, I imagine Ade is singing about the beauty of a girl as opposed to complaining about governmental corruption (not that there's anything wrong with that!). "Ase" returns to a hypnotic groove that has a superb drum and bass sound. Basically, each track is pretty much in the mould of the ones already described - rhythmic and exhilarating. A joy to listen to. West African musicianship at its very best.